WESTPORT — When the 1958 film adaptation of “The Old Man and the Sea” hit theaters, Ernest Hemingway happened to be in New York City to watch the World Series and invited his close friend A.E. Hotchner to go see the movie with him. “About 12 or 13 minutes after we sat down, he turns to me and says, ‘Ready to go?’” Hotchner said in a recent interview at his Connecticut home. 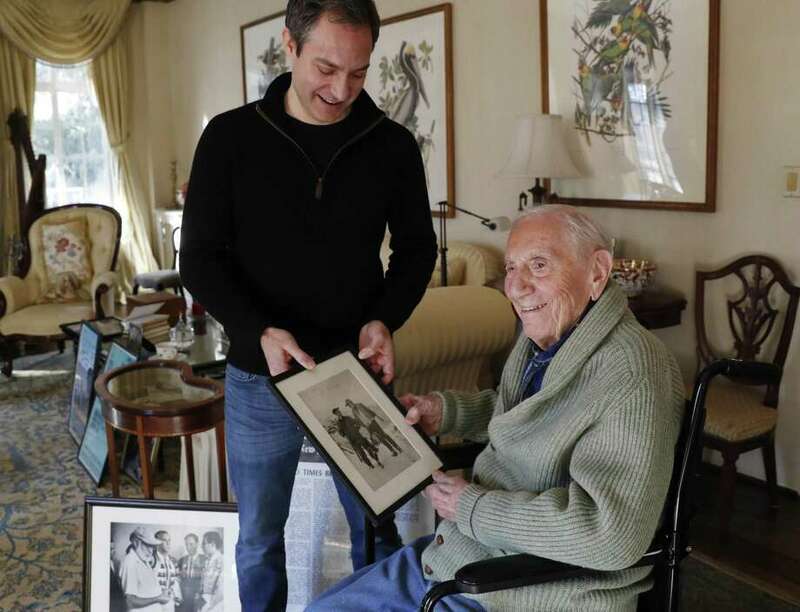 The 101-year-old author and playwright recalls them walking out and taking off down the sidewalk, Hemingway ranting the whole time that the star Spencer Tracy was totally miscast, that he looked like a fat, rich actor trying to play a fisherman. Later that night, sitting at Toots Shor’s restaurant — a hangout frequented by Joe DiMaggio, Jackie Gleason and Marilyn Monroe — Hemingway urged Hotchner to do his own adaptation someday. Hotchner said he promised he would try. More than 60 years later, Hotchner has kept his word. His stage adaptation of “The Old Man and the Sea,” a brief novel published in 1952 and winner of the Pulitzer Prize, premieres at the newly renovated Point Park University’s Pittsburgh Playhouse on Feb. 1. “It wasn’t until I became an old man myself that I really got to a version that could transport itself beyond the book,” he said. He also helped edit Hemingway’s bullfighting classic “The Dangerous Summer.” He often served as his agent and adapted several stories for television, including “The Snows of Kilimanjaro,” ″The Killers” and “The Battler,” which led to his first meeting with Paul Newman. (The two became best friends and neighbors and started the “Newman’s Own” food company together. But that’s another story). To help reel the project in, he enlisted his son Tim Hotchner to collaborate on it and help transform his draft into what will run in Pittsburgh through Feb. 17. To make “The Old Man and the Sea” accessible on stage, the Hotchners crafted a kaleidoscope of the tale, and mined the text for a new approach. The boy has a bigger role, and Hemingway himself is a character, as is a cellist who evokes the moods of the play throughout. It stars Tony Award-winning actor Anthony Crivello as Santiago, the aging fisherman, David Cabot as Hemingway and Gabriel Florentino as the boy, Manolin. Cellist Simon Cummings will perform original music for the show. The play is being directed by Ronald Allan-Lindblom. The Hotchners’ agent passed along the script to Joe Christopher, who heads up RWS’s theatrical division, who took it with him on vacation in June. “I don’t know if it was because I literally read it while I was lying on the beach, but I could viscerally see the show working,” he said. He told RWS CEO Ryan Stana it would be the chance of a lifetime to work with someone who had been side-by-side with Hemingway. The Pittsburgh Playhouse was looking for a new work to launch its first season in its renovated theater and Stana, an alumna of Point Park University, floated the idea to the school. “In less than 24 hours, they were in,” he said. The production is unique in that students at Point Park University are working on the show alongside professionals in all aspects from set design to ticket sales. It’s something Stana sees as a circular moment — youth helping bring to life the work of a centenarian playwright. At 101, A.E. Hotchner is sharp, funny and surprisingly energetic. During a four-hour interview at his home, he needed only a 10-minute break to get a glass of water. Last year, his Depression-era detective novel “The Amazing Adventures of Aaron Broom” was published and he’s still writing daily. His routine: breakfast, write, lunch, write, nightly news, dinner, gin and tonic, and maybe a movie. As for “The Old Man and the Sea,” he’s satisfied with having finally followed through on a half-century-old promise to his friend, and he’s pleased with how it turned out. “This is going to be a version that Hemingway would never have walked out on,” he said.